Microsoft will reportedly remove the preview tag from the Windows 10 Office apps in the Windows Store on Wednesday. When Microsoft rolls out Windows 10 in two weeks, the company will also introduce touch-friendly Word, Excel, and PowerPoint apps in the Windows Store. But the Office suite is actually ready a little early, as the preview versions for Windows 10 testers ditched their "preview" status in an update pushed out Wednesday. The apps are still marked "Preview" in the Windows Store, but the update pushed out to current testers removes that designation. This doesn’t mean these are the locked-in-stone final versions for the touchy, feely Office apps, as that designation makes little sense in a mobile-style app market like the Windows Store. 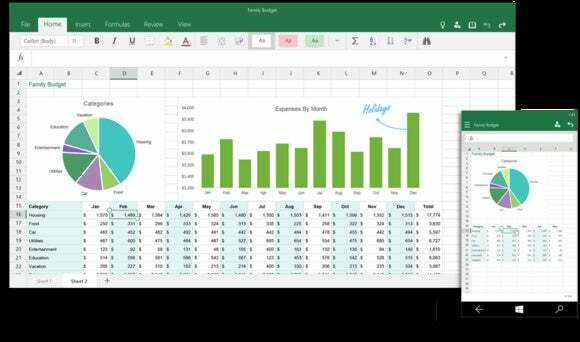 Microsoft intends to continue to add regular refinements and feature updates to the Office suite meant for use on tablets and smartphones. “Intends” is the operative word here, as the company gave us the same song and dance during the Office 2013 rollout. At the time, Microsoft suggested it would move more nimbly and provide regular updates and features to Office 365 home subscribers. That never really happened. Instead, Microsoft focused on producing new programs and apps that were largely meant for subscribers on the business side. Microsoft’s Windows Store Office apps are part of a significant departure for the company from the way it usually treats the legendary productivity suite. Similar to their touch counterparts on Android and iOS, the touchable Office apps will be available for anyone to use on smartphones and small tablets for basic editing tasks. To unlock the full potential of the apps, however, you’ll need to be an Office 365 subscriber. Why this matters: With Windows 10's July 29 launch looming it’s good to see Microsoft getting ready ahead of schedule. Offering a solid trio of Office apps for tablets and smartphones will be a key part of encouraging adoption of Windows 10 touch devices. Microsoft plans to pre-install the Windows Store Office suite on all touch-enabled Windows 10 devices.